GSBS Architects and Big D Construction are being recognized by ENR Magazine for winning “Best Project 2017” in the Energy/Industrial Category for design and construction of facilities to support the function of a new, ground up, gold mine in the Goshute Valley in western Nevada. A detailed article will appear in the November issue of ENR Southwest. A panel of eight judges represented the varied demographic imprints in the industry — from project manager to vice presidents and senior architects. 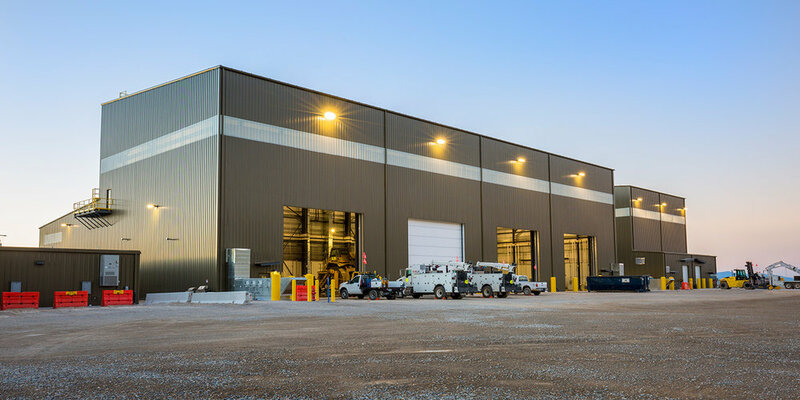 According to, Justin Jacobs, AIA, Sr. Project Manager with GSBS Architects, the development includes a 31,000 square foot fleet maintenance facility, 7,300 square foot wash bay and 15,800 square feet in two materials processing buildings along with approximately 18,000 square feet of administration support in three separate buildings and two fueling stations, one specifically designed to serve the needs of heavy mining equipment. Due to the array of mobile equipment planned to be used on site, the maintenance facility was designed to accommodate widely varying sizes and shapes of vehicles. 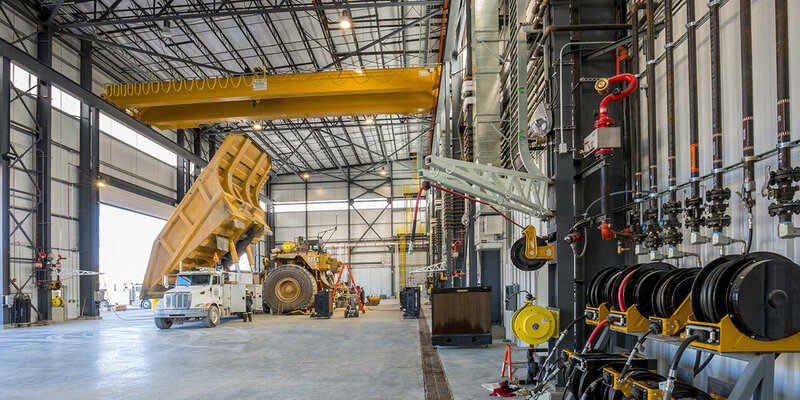 A single 40 ton bridge crane, capable of lifting the dump bed off of a haul truck spans the length of the building and is mounted at a height to maintain approximately 48’-0” clear within the space. An indoor lube room housing nine separate vertical storage tanks ranging in size from 3,000 – 8,000 gallons in volume sits adjacent to the maintenance bays to deliver six different weights of motor oil as well as grease and hydraulic oil efficiently to the necessary points of delivery. A heavily reinforced concrete floor was designed to eliminate the need for jointing to accommodate shrinkage. Translucent panels ring the high bay to provide natural light into the space to supplement the high-output efficient LED lighting. MIKE STRANSKY, ‘REVEARED THROUGHOUT THE A/E INDUSTRY,’ IS PROFILED IN UTAH CONSTRUCTION & DESIGN MAGAZINE. Ever been to lunch with Mike Stransky? Typical one-hour power lunches with the long-time Principal of Salt Lake-based GSBS Architects (Gillies Stransky Brems Smith) tend to organically stretch into two hours and change because of his magnetic presence and gregarious personality. Stransky is also easy to spy in a crowded room, with his signature white hot, close-cropped hair. “He has a big presence…that big shock of white hair,” said GSBS President/CEO Kevin Miller. “When you walked into a room you knew he was there. Everybody knows who Mike is. Fifteen years after designing Glendale Middle School, GSBS architects returned as teachers on Earth Day 2017. For Earth Day 2017, GSBS put on the “Build a Better World workshop” about engaging new generations in sustainability and architecture through building a scaled modeled tree house. The “Latinos in Action” students at Glendale participated in this workshop. The students first had to conceptualize their dream tree house, then learn how to draw their own floor plans tomake their ideas come alive, and then build a model. They were encouraged to consider environmental conservation and protection in their project. Over the years GSBS has sponsored school events to honor and promote the principles of a clean, healthy, green planet through architecture and help expose and interest young people in the field of architecture. One year students at Bountiful Elementary School learned from GSBS architect the “Top 10 Principals to Go Green,” earning a bookmark and seeds to plant an herb garden. Another year, at Hillside Middle School designed by GSBS Architects as the first LEED-designated building in the Salt Lake City School District, art students photographed the “green” elements of the new building for an assembly program. 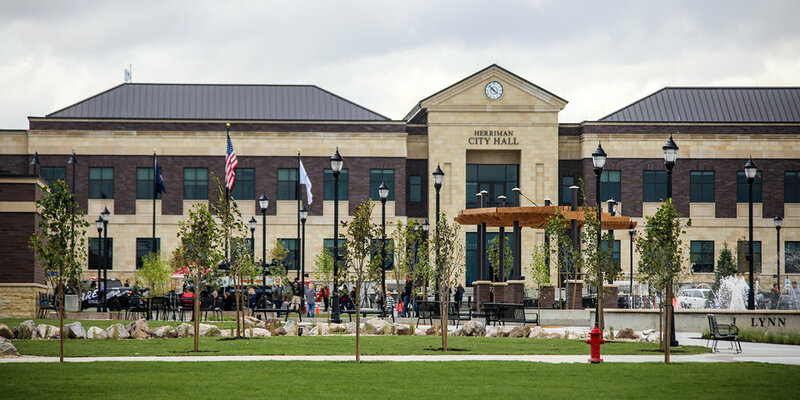 Regent Street Project Manager Jesse Allen, an architect and landscape architect with GSBS Architects, led a select team to design and create the space which is wrapping up its final stages of construction on Regent Street, and which is highlighted in this post by Salt Lake City Magazine. Allen said the unique mid-block street’s look and function was designed to celebrate its rich history and create a destination downtown. While it still allows cars and even occasional semi-truck deliveries to the new Theater, it is intended as a place for people and is generating a rhythm of its own. Utah’s current prison in Draper is steel gray and massive inside. As if from a scene in a dystopian film, long rows of clamorous cell blocks recede into the distance with four vertigo-inducing levels of cells hovering overhead, all lit with harsh fluorescent lights. The state's new prison, however, will look very different, starting with a more human scale, according to planners. Smaller units set on just two floors will all open onto a day room. Cells will be angled to capture natural light from large windows in the commons area with colored walls, while windowed doors on cells replace gray steel bars. Scheduled to open near the Salt Lake Airport in 2020, the new 4,000-bed prison will also function very differently from the facility it replaces. And while much remains to be determined, the watchwords of “humane” and “normalizing” are guiding the way, say the architects, designers and corrections officials planning the new facility. These changes are only part of the story of how the new facility is being designed to further the state's Justice Reinvestment Initiative, launched in 2015 to reduce incarceration levels by changing the lives of inmates. The initiative calls for better educational and occupational programs, and these, too, are part of the design. Utah's prison, notes Stephen Carter, founder and vice president at CGL, the Florida-based consulting firm that helped plan the new Utah facility, is part of an evolving worldwide discourse on prison design. Where past generations of prisons sought to warehouse inmates with token efforts at reform, the new generation puts successful transitions to society as the top priority. This means changes in look and feel, as well as in programs offered and the attitudes of staff and correctional officers. The radical theory of the new prisons is that inmates who live in a normal environment adjust more quickly to normal life upon release. It begins with architecture — including the experiences of light, sound, color, better noise control and more natural views in yards and through windows. But the new thinking also extends to personal, eating and sleeping spaces, exercise, interaction with prison staff, routines of learning and work, and more natural movement through a community. “If we start with the stereotypes that prisoners are evil monsters who deserve penal hell holes, we’ll take the same failed approach, but if we design prisons that look more like colleges, then we can start seeing prisoners as people with potential," said Yvonne Jewkes, a criminologist at the University of Brighton in the U.K. and a key voice in the emerging international conversation on prison design. That community of experts will be closely watching Utah's new prison, one of the largest and most ambitious projects to date. Utah new facility is, quite literally, the "next big thing," the boldest effort to date to combine a massive, centralized facility with the new principles of prison design. Not everyone will agree about the results, and some experts are already arguing that Utah could be even more bold in smoothing the path to change and recovery. While details remain in flux, the new prison's planners say they expect the Utah facility to lean heavily on recent “best in class” models that emphasize more natural scale, color and light. One inspiration for Utah’s new design is the Las Colinas Women’s Detention Facility in San Diego County, California, which opened in 2014. Las Colinas feels like a very nice college campus, with large windows, cheerful interior color schemes, noise proofing, and murals on the walls. Outside, Las Colinas sports walkways through lawns with natural landscaping, hedges and trees. There is even an outdoor amphitheater. Landscaping required special consideration, Carter said, noting, for instance, they had to make sure the mulch was chopped finely enough that its shards could not serve as weapons. Carter was heavily involved with Las Colinas from the beginning, working with San Diego County as early as 1999 on its master plan, and then returning to help the county frame its proposal for a cutting-edge facility for women. “We translate policy, space and behavior into architecture,” Carter said, describing his company’s role. How far Utah’s planners will be able to go in the direction of Las Colinas is uncertain. A smaller facility designed for low-risk women on a generous budget, the San Diego facility sets a standard for amenities and openness that Utah cannot hope to match. Trees will be out of the question for Utah, Miller acknowledges. But Las Colinas is not alone. It’s part of an international movement away from stark utilitarian prisons and toward the use of natural light, space and color. Scandinavian countries are leaders in this movement, and the Rolls Royce of the world's maximum security prisons is thought to be Halden Prison, set within a forest along Norway's southern border with Sweden. Widely hailed as the "most humane prison in the world," Halden houses roughly 250 of the most serious offenders. Unlike most U.S. prisons, Halden sports large windows with ample views of evergreen trees within the grounds, bright rooms with plenty of natural light, and modern, comfortable furniture. Halden looks more like a college dorm than a maximum security prison. The fence is overshadowed by tall evergreens inside and outside the barrier. Prisoners get their food from a prison grocery store and cook it in communal kitchens, though kitchen knives are firmly cabled to the walls. “Halden is a humane prison, but we should be wary of saying that it is the model prison that all others should aspire to,” said Jewkes, who spent several weeks doing research at Halden last year. Halden is not necessarily as idyllic as all that, she says. Many prisoners only spend one hour a day outside, and only in the smaller yards adjoining their building, not amongst the evergreens. The therapeutic garden is underused because they lack staff to accompany the men in the garden, and the jogging track, widely cited as a key feature, is for staff only. And, because it is so expensive, at over $80,000 per inmate per year, Jewkes said, officials in Norway tell her they will not be building any more Haldens. Needless to say, anyone hoping for Utah to be Halden writ large is bound to be disappointed. But the general model — light and color, green spaces, artwork and even normal activities like cooking for oneself — do reflect the front edge of prison innovation. And Utah will be judged by the international community, in part, by how well it captures this new direction. The most radical shift in Utah's new prison design, however, is not visible design but the interactions and routines the new structure allows. Known as indirect supervision, this approach isolates inmates from officers, limiting risk but also essentially turning much of prison control over to inmates. In American prisons, inmates and their gangs typically provide much of the social control (and chaos) themselves. The new theory involves a focus on inmates as human beings — rather than as storage units. “The fundamental question,” Miller said, “is how do the humans interact?” And the answer, he says, is that they need more healthy interaction with officers and with other inmates. Utah is following international innovations in architecture and supervision models, but in at least one area it is cutting new ground. The new prison will be the first to combine the economies of scale available from large size and centralized services with smaller, segregated communities that serve specific needs. Just as a large university offers cultural and academic amenities not found at a small college, Utah’s prison planners believe they will be able to offer top quality education, occupational training and health care at scale, while still separating populations that need to be handled differently. Built around a main street and a hub of administrative and medical facilities, the prison will consist of smaller communities carved from the general prison population. These include separate buildings for different groups, ranging from maximum security to female inmates, from those preparing to re-enter society to addiction and behavior therapeutic communities. Women, the mentally ill and therapeutic communities will have “sight and sound” separation from the noisier and harsher general population. These smaller communities are critical to the success of the state’s justice reinvestment program, Miller said, and separating therapeutic communities from the general population will allow the new skills and commitments those inmates learn to take root. The general prison population will be separated into two nearly identical units. This will allow prisoners to be safely separated from those who might hurt them, without putting either party into restrictive isolation. The general population also has a complete “step down” program, Miller said, which means that entering prisoners will start in a highly controlled environment but move into more comfortable living arrangements with good behavior. Utah’s natural light and commons areas will be a huge leap forward from the long gray rows at Draper, but it will not be a Halden or even a Las Colinas, and many wish it would push the boundaries further. One of those is Elizabeth Grant, an architectural anthropologist at the University of Adelaide in Australia, who holds that most prisoners can both handle and benefit from more freedom than we tend to give them. Grant gives grudging respect to efforts like Las Colinas. But she wonders why new prisons like Utah's couldn't adopt a less punitive approach for those who earn the privilege. The key, Grant argues, is to give inmates a normalcy that many of them have never experienced to better prepare them for both responsibility and trust when they leave. "Trust begets trust," Grant says. She points to the Boronia Pre-Release Center for Women in Perth, Australia — a grassy open campus of cottages without walls, where women live and cook together in small groups, one of several cottage-based correctional facilities in Australia and Grant’s preferred approach. And as with Boronia, when Shakopee did finally put up a fence last year, Carter says it was mainly to keep people out. Kids on their way to school had been cutting through the facility. Nor is Shakopee reserved for light offenses or pre-release. It typically houses up to 100 murderers among its 600 women prisoners. In the past 20 years, there have been 16 escapes from the wide open prison, but all were quickly apprehended. The key to the freedom at Shakopee, Carter says, is that the women there earn the privilege, and they recognize that Minnesota has much tougher places they could go if they fail. Carter embraces Grant’s general aspirations. But of necessity, he has to pick his fights and temper his expectations. He knows that costs will always be a factor, and that the safety of staff and inmates is paramount. "My next windmill is private toilets," Carter said. He says there are models in Canada and Europe that show private toilets can be built for not much more space or money and without compromising security. Recently compiled data proves conclusively that Salt Lake City's new Public Safety Building will use no more energy than it creates. In fact, since the building was occupied in 2013, efforts by Salt Lake City with support from GSBS Architects, have reduced the building’s measured energy consumption to match, and even exceed, levels predicted during design. • The average building of this type uses 266% more energy. Not only has the building achieved record-breaking energy efficiency, it is being hailed by Urban Lands Magazine (Feb. 2017) in its world-wide list of 10 outstanding government buildings. The article identifies design features that balance significant security elements (that tend to shut out the public) with a transparency in aesthetic and experience that promote interaction and visitor engagement. The project’s ability to function after a 7.5 magnitude earthquake, resist significant domestic terror threats, and produce enough renewable energy each year to offset its consumption also secured its position on Urban Land magazine’s list. 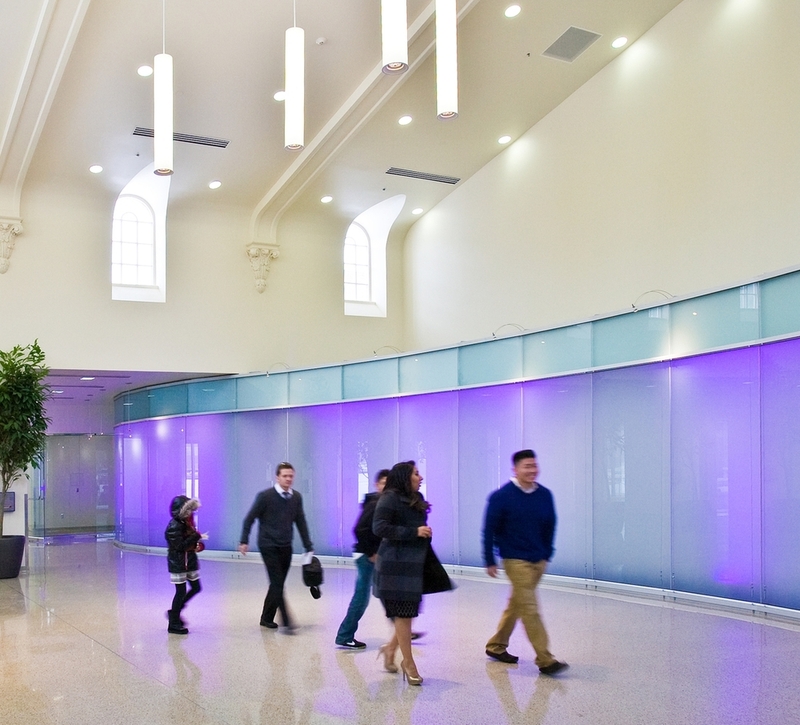 Kevin Miller, President of GSBS Architects, said the team of architects designed it to compliment the area of downtown Salt Lake City which is home to the historic City and County Building, the State Courts Building and Salt Lake City Public Library. “A campus feeling was requested and we created welcoming outdoor space to accommodate large public events which spill over several blocks,” Miller said. The approximately $80 million Public Safety Building, home to the fire and police departments, functions as the nerve center for addressing all citywide emergencies. It even anticipates a 7.5 seismic event that is predicted to hit Utah's highly populated Wasatch Front. This requires the building to not only be designed to immediate occupancy seismic standards in order to continue to operate through the seismic event, but it is able to do so separately from the electrical grid.